take one gorgeous Hero Arts stamp, Dogwood, and make three cards for three different purposes using very different colours. So, Day 1 - BLUE. Blue + Polka dots + Glitter = my personal heaven. Supplies: Stamps - Hero Arts; PP - Papertrey Ink; Embossed cardstock - My Mind's Eye; Stickles - Star Dust; Copic - B32; Coloured Pencils; Nesties - Labels 8. I combined the stamp with a happy sentiment from THIS yummy set. And the blue paper is from THIS pad - my fave paper. See you tomorrow for Day 2 - vintage. Wow-wee, love the embossed nestie background! Perfectly pretty in blue! Love that dogwood stamp! You do BLUE so well Lucy! How are you? Wow, so pretty in blue! I love how you cut out the flowers from the design, it's a great look. 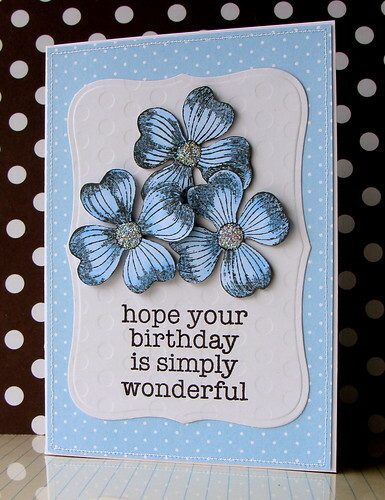 What a lovely birthday card....can't wait to see the vintage version! Fantastic Lucy, Love how you cut out the flowers. and the blue is just beautiful. Can't wait for tomorrow. What a GREAT idea, Lucy! 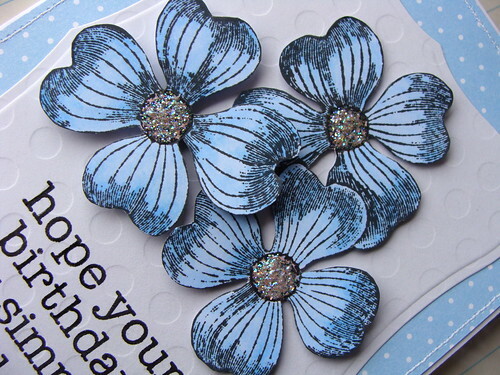 I love this stamp in blue Looking forward to the other cards! Love it! This is a great challenge - can't wait to see what you do next! Gorgeous, Lucy! Can't wait to see more! lovely. can't wait to see the next 2 cards! That's so beautiful! I love this challenge and look forward for more! Love the blue with glitter and the subtle texture on the white panel is awesome!